Enterprises are accessing the public cloud increasingly as an essential part of their IT operations where speed, flexibility and low costs are essential. Public clouds offer easy, speedy access to IT resources as you need them and when you need them, reducing the cost and burden of ongoing hardware and datacentre management. We deliver multiple cloud offerings to help you get the most appropriate cloud solution, supported by tools, services and connectivity. This means that whatever cloud journey your business is taking, we can support you along that path, reducing complexity and risk. Public cloud is perfect for enterprises starting out on the cloud journey or for companies who need to adopt a flexible and cost-efficient platform for public workload sharing. It’s ideal for businesses such as retail and online organisations looking for high availability production workloads and easy access or alternatively for IT professionals to deliver quick and scalable test or development environments. We can help you find the right mix of clouds to suit your business, your people and your applications. Whether it’s providing a secure, compliant and highly performant private cloud, delivering effective public cloud and cloud connectivity on its own or as part of a multi-cloud solution, we extend your company's network, and we provide you with expert support. Maximise the business outcomes of your public cloud service with us. Combine your public cloud with other cloud services from us and develop your multi-cloud strategy – you can optimise on storage, add further security services, use our global network to maximise availability or seamlessly combine with our private cloud, managed hosting or co-locations services. 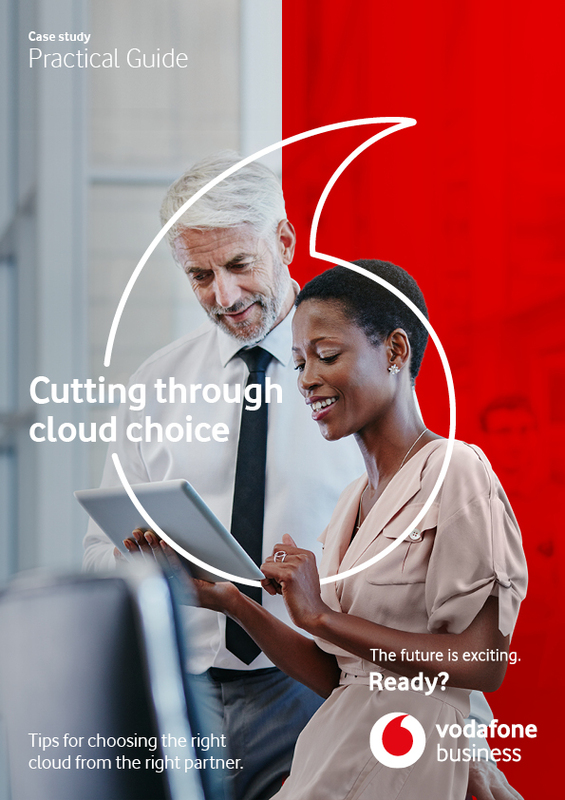 Vodafone IP-VPN cloud connect provides a secure, private connection to the public clouds you already know. It’s a global solution, leveraging direct partnerships with major providers including Microsoft Azure, Amazon and Salesforce. With safe, high performance connections to leading public cloud providers, businesses can benefit from better operational agility, better-connected employees and better customer engagement, while flexible short-term contracts enable you to scale capacity as needed. AWS is a market leader in public cloud services. It provides a large catalogue of on-demand cloud computing platforms to individuals, companies and governments, on a paid subscription basis with a free-tier option. The technology allows subscribers to have at their disposal a full-fledged virtual cluster of computers, available all the time, through the internet. AWS offered by Vodafone allows you to receive AWS platform services and platform support with one bill, one provider and a single service support team. This solution removes the hassle of complicated infrastructure management and allows you to move to a flexible, variable expense. You don’t have to guess at capacity planning and can go global in minutes. This solution provides you with all benefits of the Alibaba public cloud, in addition to connectivity, security and support services from Vodafone. This is a scalable solution which can be managed via self-service and at a cost that is right for you. We also offer a range of security services that you can benefit from, along with 24x7 support from our expert team. Choosing the right cloud solution is a significant decision - and the right provider can help you elevate your use of cloud, to become smarter and more productive. Here are the key questions you must ask to help shape your choices. Speak to us about the benefits of our public cloud solutions. Moving workloads to the cloud will accelerate and by mid-2018, 60% of all enterprise workloads will be in the cloud. Vodafone can offer global deployment for Alibaba Cloud including access to China, with one partner and a single bill. We have our cloud capabilities in 6 continents over 28 geographies.